Here at Lil' Red Barn, we think it should be easy to reference your current chain to other brands. Now you can! Just use our easy to read chainsaw chain reference conversion chart below and you too can quickly decipher and reference your chain part number. If you need more information about what type of chain try the chain guide below. Need some serious info about Chainsaw Chain, Different Types of Chains, Labeled Diagrams & Specifications? 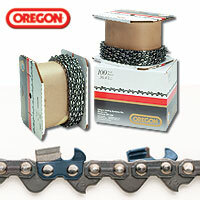 **This includes everything you could possibly want to know about chains, types of chain, important maintenence tips and safety information as well - Published with permission from Oregon.